The wobble has worsened of late, and the data supports this statement. The northern hemisphere has had more darkness, cold, and snowfall this past Fall than expected or of record. This has also been noted by the Inuit in the Arctic. 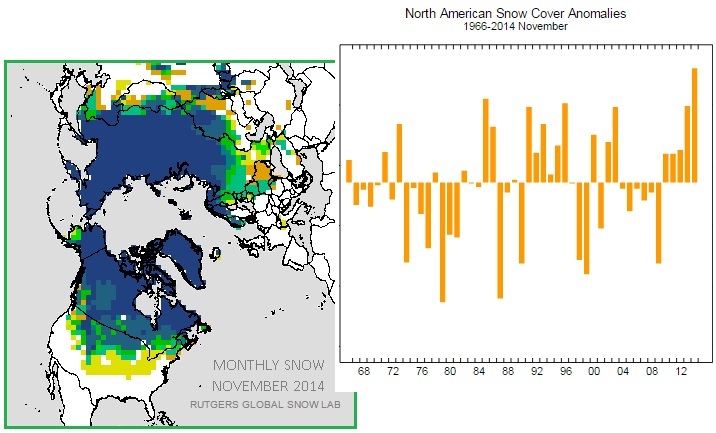 In 46 years of records, more snow covered the Northern Hemisphere this fall than any other time. It is a very surprising result, especially when you consider temperatures have tracked warmest on record over the same period. "Their Sky Has Changed!" Inuit Rlders Sharing Information with NASA Regarding Earth's "Wobble"
The elders maintain the Sun doesn't rise were it used too, they have longer day light to hunt and the Sun is higher than it used to be and warms up quicker than before. The elders who were interviewed across the north all said the same thing, their sky has changed. The stars the Sun and the Moon have all changed affecting the temperature, even affecting the way the wind blows, it is becoming increasingly hard to predict the weather, something that is a must on the Arctic. The elders all agree, they believe the Earth has shifted, wobbled or tilted to the North. 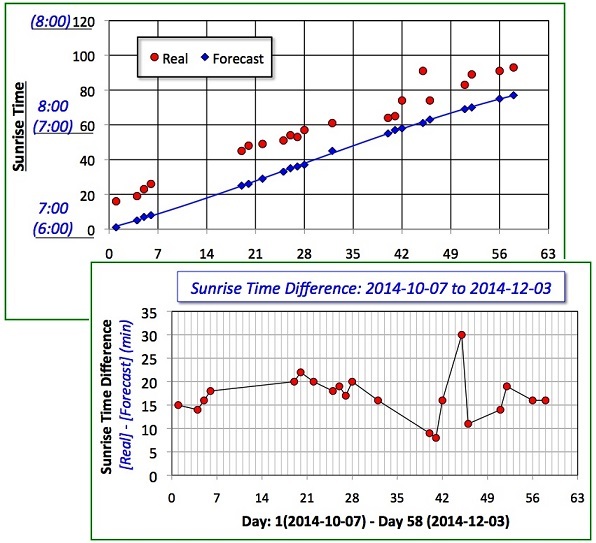 Charted in central Wisconsin, the sunrise was noted coming up to 25 minutes late during October-December, 2014. At the same time, sunset was up to an hour early in Wisconsin, as noted on December 1, 2014. The Polar Push of the wobble, pushing the magnetic N Pole of the Earth away, has given Wisconsin less sunlight. In this year, in Wisconsin, the sun rise at least about 15 minutes late. Here in Wisconsin it is way too low at sundown, darkness descending a full hour ahead of time. On December 1 I noticed it was completely dark at 4:30. The Sun was scheduled to go down at 4:30 but twilight lingers for an hour afterwards. We anticipate on the shortest day of the year – December 21 – that it will be dark at 5:30. Others in the village noted this odd and early darkness too. On the other side of the world, the wobble paints a different picture. India found the Sun higher overhead early in the morning on December 4, 2014 but heading too far South by noon. To the northwest, in the Ural Mountains in Russia, this swing to the South by the Sun is noted mid-morning, as noon in India is mid-morning there. The Sun thus is rising a full hour late in the Ural Mountains, though on time for the sunset. I find sun slightly oddly placed that it is unusually higher that it should be at 9 am from our place in Karnataka India, about 2hrs earlier and never is above head at noon but placed towards South. I live in Russia, Ekaterinburg, Ural mountains. At the end of 2014 again five days see how late the Sun rises, moving over the horizon, i.e. low. At 10am rises and 16 of the evening sunset. In the night sky the big dipper is located close to the ground, i.e., it is very large and also near the horizon. The science of the Earth wobble has not been lost among scientists, at least not among the French. 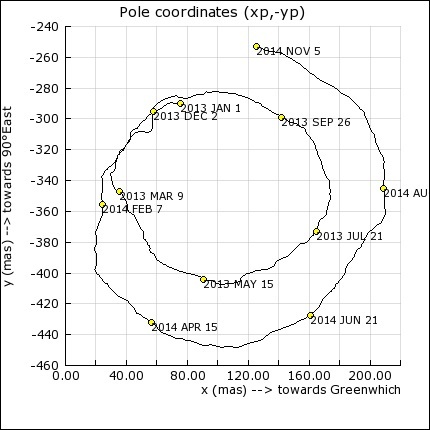 The Polar Motion for the last two years shows that the wobble has gotten more extreme in 2014. 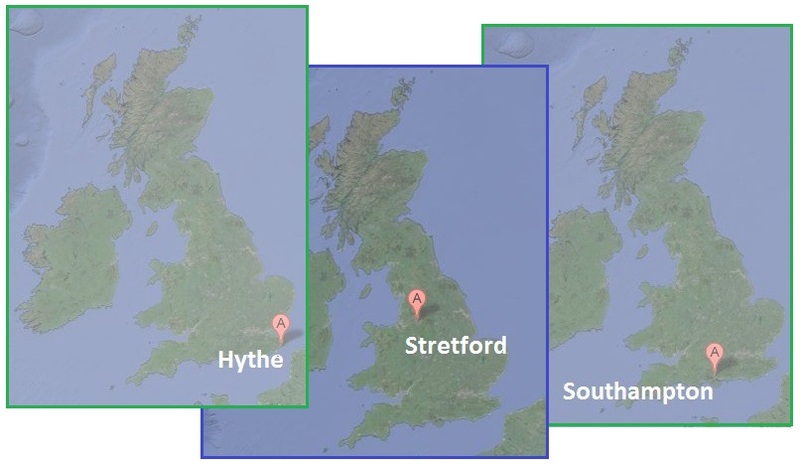 The International Earth Rotation Service (IERS) is an interdisciplinary service that maintains key connections between astronomy, geodesy and geophysics. Per the Zetas, a recent crop circle in the Netherlands on November 23, 2014, unquestionably legitimate, warned that the wobble experienced today will only get worse when the Last Weeks arrive. Per the Zetas, mankind has subconsciously noted the Earth wobble, and would thus have no problem grasping the meaning of this Netherlands design. ZetaTalk Prediction 12/6/2014: The Earth wobble has recently increased, such that the Sun is undeniably in the wrong place for much of the world. Deluge has increased dramatically. Wind storms are evident and notable for their violence. Earthquakes worldwide are commanding attention, even though the seismographs have been toned down to deny their magnitude. 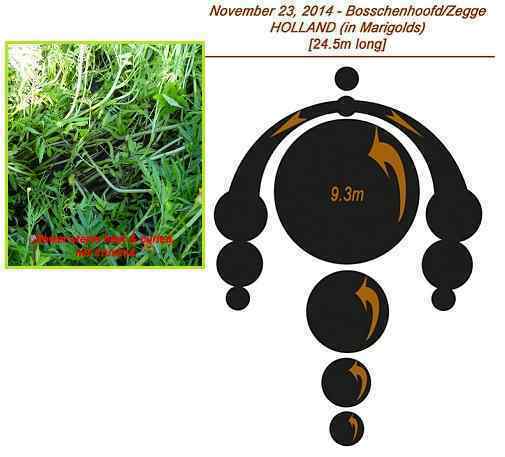 The Netherlands crop circle is showing what is pending in the future – the Severe Wobble leading into the Last Weeks. The Earth will flop from side to side attempting to placate the magnetic onslaught from Nibiru, aka Planet X. The closer Planet X comes, the more violent the wobble. Artifacts from the Holy Land have just recently come to light, as they had been hidden behind a book case in the former home of Sir William Petrie, a famous archeologist who died in 1942. 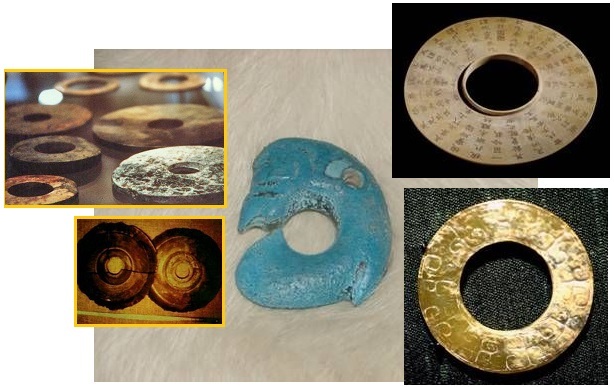 The artifacts included a Gold disc with lettering in an unknown language, not a surprise per the Zetas as the Annunaki used Gold in their Arc of the Covenant which was likewise a communication device, and the printed language of the Annunaki was not synonymous with Egyptian hieroglyphics. Per the Zetas, it was this odd language but primarily the references to aliens that discombobulated Sir Petrie, thus he hid the artifacts away – out of sight out of mind. 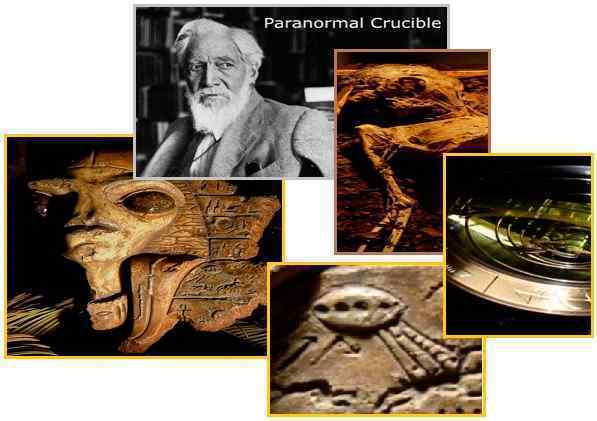 ZetaTalk Insight 12/20/2014: Why did Sir Petrie, who died in 1942, hide his discoveries? Aliens, space ships, and an unknown language on a communication device, all located in what is considered the Holy Land by Christians and Muslims alike. The crusades were fought over this territory, and wars are still raging between Israel and Palestine. Raised as a Christian, Sir Petrie could not place the little aliens in the Bible, but his reverence for archeological findings prevented him from destroying them. Thus they were buried behind his book shelves, just as they were put into mental compartments in his brain and there forgotten. Prior ZetaTalk is thus confirmed to be accurate by the correlation between the Arc of the Covenant and this Gold disc discovered encoded with a previously unknown language. But there is another, more astonishing ZetaTalk confirmation. The little alien, represented both as a mummy and in a carving among Sir Petrie’s artifacts, is exactly the little alien showing up lately around the world in photos. This was presented in Issue 412 of this newsletter. Note the extreme similarity in the face of the little alien in Argentina and the one depicted on Sir Petrie’s hidden artifacts. A group of tourists allegedly photographed an unknown small being in Capilla del Monte in Argentina. These images of a humanoid creature have not been confirmed yet, but they are very interesting. ZetaTalk Confirmation 8/9/2014: The film from Argentina is genuine, as continuing tests on the film will show. 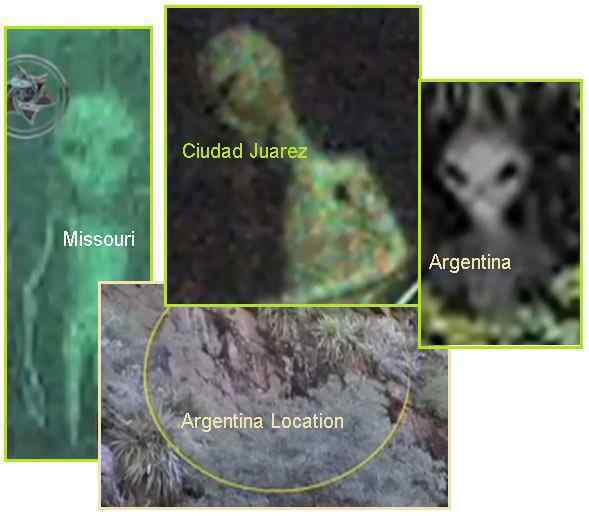 It is notable that the little alien seen in almost all captures presented on this video seem to be similar, from Argentina to Missouri to London. How can this be when, as we have stated, there are over 1,000 different life forms in attendance on Earth. This alien group has volunteered to be the ambassadors during conscious contact sightings, as they are slight, non-muscular, non-threatening, and have disproportionately large big eyes so have an infant-like facial appearance. Per the Zetas, this little alien race is considered non-threatening, and thus their specialized role. They are greeters during mankind’s current Awakening to the reality of the alien presence. But in the past, they were a balancing force to help the Egyptians deal with the highly Service-to-Self influence of the Annunaki and their fat snake allies. As detailed in Issue400 and Issue407 of this newsletter, it was this Service-to-Self race that provided the Annunaki with their ability to lift heavy stones, the better to intimidate early man. And here we have the alternative popping up today on photos. Hello again, you hard working little alien! ZetaTalk Insight 12/20/2014: Where the Annunaki had an alliance with the fat snake race of aliens, a Service-to-Self group that provided control over gravity to the Annunaki so they could raise large blocks of rock, the Egyptians were not so inclined. They preferred to encourage visitations from visitors in the Service-to-Other, which to counter the monstrously negative influence of the Annunaki and their fat snakes was provided by small, gentle, large eyed visitors who had the semblance of young children. Such small hominoids are being used today during mankind’s Awakening. If the little alien is currently popping up all around the world, just as he did for the Egyptians in the past, then we also have de ja vu in airport shutdowns. On April 30, 2014 the LA airport had hours of downtime, flight traffic control offline, which they claimed was due to a computer glitch. Per the Zetas, this did not have the ring of truth. Supposedly a high altitude plane threw the computer system for a loop, though the software had long been debugged and had been in service for decades. There is a ground stop for that region. This affects the bottom third of California, the southeast corner of Nevada and the northwest corner of Arizona. And also southwestern Utah. Flights bound for LAX are being held on the ground. The outage began with news that planes are not being allowed to take off at Los Angeles International Airport. LAX airport spokeswoman Nancy Castles said Wednesday afternoon that the Federal Aviation Administration had put a "ground stop" on departures. Arrivals were still being accepted. Castles wasn't sure what caused the problem. An FAA spokesman did not immediately respond to a request for comment. ZetaTalk Insight 5/10/2014: As predicted, the FAA has proffered computer program gibberish as its excuse for the LA ground-stop on April 30. The common man may believe that a computer system that had been in operation literally for decades would be befuddled by a high altitude plane but anyone familiar with how such systems are designed knows better. Every possible branch of logic is taken into consideration, and provided well-tested program code. Computer systems are given simulated input during system testing, so bizarre situations are tested, as well as routine situations. Thus this excuse, where the system seemed dumbfounded by a high altitude plane, fails on many fronts. What was the problem? Per the Zetas, it was electromagnetic screech from the rock at the center of the N American bow. 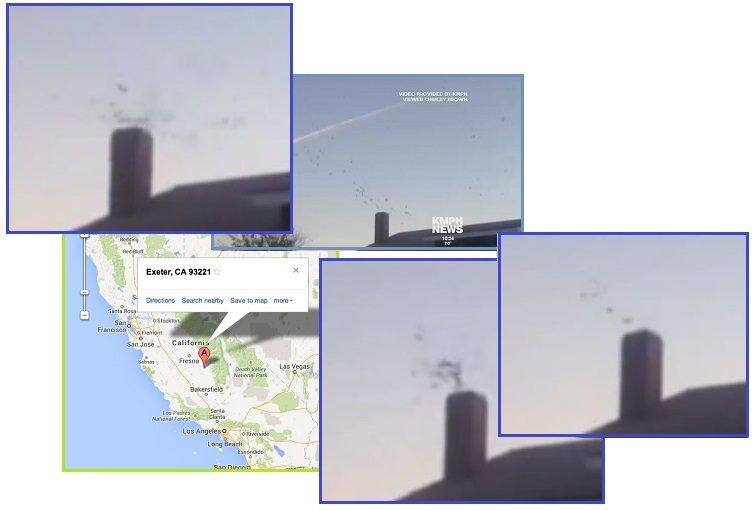 Thus the simultaneous reports of confused birds in nearby Exeter, California. ZetaTalk Insight 5/10/2014: We have described the bow shape being formed by the 7 of 10 plate movement stress on the North American continent. This bow is centered in San Diego, fanning out from there across the US. Compressed rock emits electromagnetic screech, which when combined with the electro-magnetic disruption caused by the wafting charged tail of Planet X can create electronic arcing. This type of electronic surge will shut down electronic equipment, which has surge protection. Now in another de ja vu, we are having a similar incident in the UK. Airport downtime, and outbound flights cannot take off as flight traffic controllers are offline. And once again, blamed on software, so easily victimized as the common man does not readily understand how software logic works. NATS, Britain’s national air traffic body, said a computer problem at its centre in Swanwick, England, had touched off troubles in the system but that was fixed and the agency was in the process of returning to normal operations. Officials at London Heathrow Airport blamed the failures on a power outage. The shutdown came at the start of the weekend in a sprawling city with five commercial airports, including London Heathrow — Europe’s busiest — as well as Gatwick, Luton, Stansted and London City Airports. The Swanwick centre has been plagued by problems since it opened more than a decade ago. It only swung into operation in 2002 — six years after its planned commissioning date and double its original budget. Software and reliability issues have caused repeated disruption since. Last December, a computer problem at Swanwick took 12 hours to fix. Planes were grounded and passengers experienced hours of delays and cancelled flights as London airspace was severely restricted for about an hour. Runways were closed for a period at Heathrow, Europe’s busiest airport, and Gatwick. Flights which did land at London’s airports were unable to unload passengers with gates gridlocked. Others were taking off up to four hours late. Flights started to depart again after 4.15pm, but passengers travelling to and from London’s largest airports faced lengthy delays and cancellations. Where the media inferred during present downtime that software problems were common with the UK program, referring to a December, 2013 incident, this incident was minor and hardly precluded a disaster where the UK airports were out of service entirely for hours. At the centre of the difficulties at the Hampshire centre is a problem with the telephone system which has prevented controllers making what is normally a smooth transition from night-time to daytime operations. The centre reduces its operations at night when only a handful of the average 5,000 flights handled by the centre every 24 hours are in the air. But what does relate is the electromagnetic rock screech the UK region has recently experienced, though this was dubbed to be a “mating frog” noise by the media. This UK hum was detailed in Issue 372 of this newsletter in 2013. Per the Zetas, whether an electromagnetic screech is caused by rock compression, as in the N American bow, or by the stretch and bend that rock in the stretch zone of Europe endures, the result is the same. Electronics do not work well. De ja vu, LA airport! ZetaTalk Comment 12/20/2014: What caused the recent outage at Heathrow and Gatwick airports, where outbound flights were delayed for several hours. The computer system was blamed, which was oddly reminiscent of the outage at the LA airport on April 30, 2014. Both the LA and Heathrow/Gatwick outages were caused by electro-magnetic screech from compressed rock. On the N American continent, which is under an extreme bowing stress at present, the center of the bow is San Diego/LA. The UK islands are under a different kind of stress. They are all being pulled down by the spreading Atlantic, snapping off from the continent of Europe, and one of the snapping points is of course the English Channel. 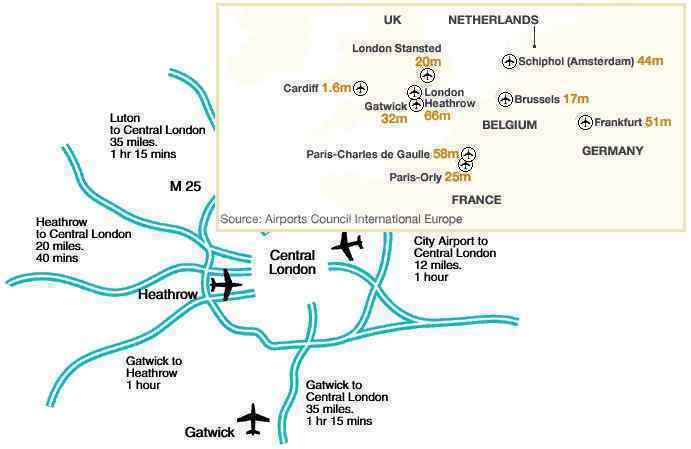 Note that the Heathrow/Gatwich airports are close to where the UK hum was recorded in 2013. What NASA cannot accomplish, the bugs can. We recently covered in Issue 404 of this newsletter how envious mankind is of the ability of the visitors to switch densities (as in the Philadelphia Experiment), travel faster than the speed of light (ie “warp speed”), and teleport themselves from one spot to another (ie “beam me up Scotty”). Despite bragging and chest thumping, the only thing jealous man has accomplished is levitating due to magnetic repulsion, a trick that even school children can do with their toy magnets. Man’s experimentation with density switching only resulted in disasters, such as the Philadelphia Experiment. And where density switching happens naturally, though only momentarily, it is due to Mother Nature in places like the Devil’s Triangle. ZetaTalk Explanation 7/15/1995: The Bermuda Triangle does indeed have unusual qualities, as do other places here and there on Earth. Magnetic anomalies are reported, where compasses swing wildly, clocks stop, and concrete objects fade from sight. What's causing this? These places, fortunately few in number, are an outlet from the center of the Earth for a byproduct of the Earth's compression, a gravity byproduct so to speak. A vent, from where subatomic particles not known to man surge forth periodically, and woe be to the man or fish who finds itself in the way. Here and there around the face of the Earth are similar outlets for this byproduct of the Earth's compression, many of them well known due to the havoc shippers or travelers experience - an area off the coast of Japan, and in one of the Great Lakes, for example. Enter the insects. A Russian entomologist, Viktor Grebennikov, discovered that some bugs have a levitation quality in the shape of their undersides. He provided a video of this, where he manipulates the bottom of a platform he is standing upon to face bug-bottom down and levitates a few inches. He died in 2001, and his platform was subsequently stolen from a Russian museum, no doubt by jealous humans determined to learn how to control gravity. Per the Zetas, good luck with that. 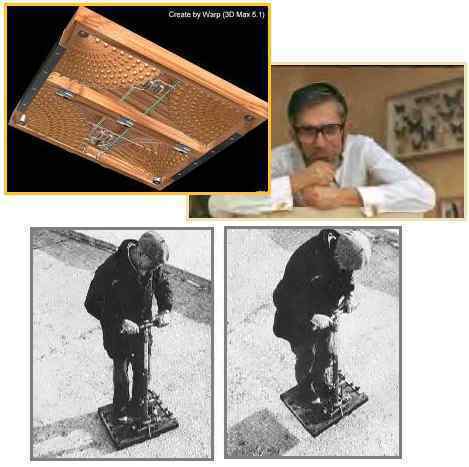 Viktor Stepanovich Grebennikov (1927–2001) was a self-proclaimed Russian scientist, naturalist, entomologist and paranormal researcher best known for his claim to have invented a levitation platform which operated by attaching dead insect body parts to the underside. Grebennikov wrote detailed accounts of his experiences flying over the Russian countryside using his levitation device. These flying experiences as well as his reported observations of other paranormal phenomena, usually involving insect nests or parts, appear in his self-published book My World (Sovetskaya Sibir, 1997). Although once popular with readers who dreamed of human unpowered flight, Grebennikov's flight and other paranormal claims were promptly rejected by skeptics and scientists outside of the paranormal community as his reports were devoid of conclusive proof or public demonstration. He has discovered antigravitational effects of the chitin shell of certain insects back in 1988 but, the most impressive concomitant phenomenon he has discovered at the same time was that of complete or partial invisibility and/or of distorted perception of material objects entering the zone of compensated gravity. As I saw it, the intricate sponginess was clearly unnecessary either for the strength of the part, or for its decoration. I succeeded only when I positioned them vertically. What I got was a multi-layered chitin block and I placed it on the desk. Even a relatively large object, such as a thumbtack, would not fall on it. Something pushed it up and aside. ZetaTalk Explanation 12/20/2014: Grebennikov did not discover how to control gravity, but merely a means by which some insects deflect gravity when unfurling their wings. Grebennikov’s insects had as he noted an odd texture to their undersides, an evolutionary advantage as it allowed the insects to take flight more readily. More than the shape, it was the chemical composition of the chitin shell. Where he could amass these shells and maneuver them to elevate a platform by a few inches, this technique did not allow him to levitate large objects nor fly across the landscape. Nor did any temporary density switching he observed mean that time travel was involved. Density switching is a temporary effect of rapid gravity particle flow. This is temporary. Grebennikov expanded on his discovery, in the same manner Billy Meier did as a contactee, enjoying the attention and the stage. But his very real accomplishments and careful documentation of course caught the eye of the elite hoping to find the elixir of space travel, the magic solution. Thus his platform was stolen from the museum. Diverting gravity particle spurts emerging from the Earth is not controlling them, as they immediately escape and go in any of a number of directions, all of which man cannot control. Temporary levitation can result in a tilt sideways, or a sudden drop. It does not result in space travel.